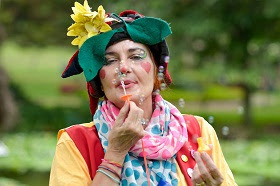 Adi Paxton aka Cherry the Magical Clown presents 2-4-1: A Lot More Fun. Running next week at Rhumbelow Theatre in Durban, this is a double bill featuring two shows in one: A puppet play and a clown show for double the fun. The format that she successfully started at the National Arts Festival in Grahamstown, in 2014 allows Paxton to present a new show in the series. The first part is a holiday themed eco-adventure puppet story: Splish, Splash, Sploosh! featuring a magical frog, a rather prickly young cactus and other waterwise plants near a rather dry waterhole. What happens when the world is a whole lot drier than you're used to? Find out in this tale told with audience interaction and involvement, a few magic effects and some humour. This is followed, after a magical change, by a ditsy performance by Cherry the clown, who along with her AbracaZebra celebrates a really fun time as she creates a show with a little help from her family audiences. Whether its waving your hands, singing along or becoming a character come along and join her too. Each mini show is around 25 minutes long with the total performance time of 50 minutes, Shows are family friendly and suited for audiences aged 3 to 103. Then everyone can stay and join a free half hour workshop making flying paper objects and shapes.